New York, NY-based ClearRock Properties, an owner and operator of office properties across the Northeast, and Stamford, CT-based Juster Properties announced today that the partners have purchased 201-207 South Street in Downtown Boston’s Leather District for $27.5M. JLL Managing Director Jessica Hughes represented the seller, Meritage Properties, in the transaction. Built in 1909, 201-207 South Street is a 73,689-square-foot, six-story office building with exposed ceilings, original brick walls and an abundance of natural light. The building was recently revitalized with a full facade restoration, renovation of the entry, lobby, elevator cabs and common areas, and conversion of a 4,000-square-foot storage area into quality office space. Current tenants include Credo, Publisher’s Clearing House, BlueConic and Evidox. 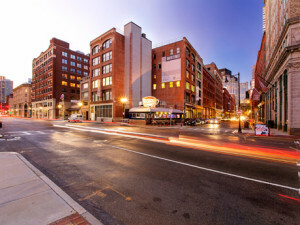 The historic district has become a destination for tech, advertising, architecture and design firms that seek not only the brick-and-beam charm and quality amenities that characterize the area, but also its proximity to I-93, I-90, Atlantic Avenue, South Station, and some of Downtown Boston’s trendiest neighborhoods. “We are positive about the continued viability of the area, which has in recent years benefited from new development, conversions and the creation of the beautiful Rose Kennedy Greenway. We anticipate that the development of parcels within the 20-acres of adjacent State-owned land will further improve the area in the future,” added Grant, whose firm in partnership with Juster Properties also owns and manages 485 Massachusetts Avenue in Cambridge’s Central Square. Under the new Ownership, JLL will continue as leasing agent while Lincoln Property Company will continue as property manager. ClearRock Properties is a real estate investment, development and operating firm focused on urban and suburban office properties, with a strategic plan to add value through proactive management. The firm’s principals, Steve Grant and Doug Winshall, have over 45 years of experience in acquisitions, leasing, asset management, property management and construction. ClearRock currently owns and/or operates 1.7 million square feet in 12 buildings across the Northeast. Juster Properties is a real estate investment and management firm with a diverse portfolio encompassing over 1,500,000 square feet in both urban and suburban locations. The company is comprised of an increasingly expansive portfolio of office buildings, apartment houses, shopping centers, and industrial properties. Meritage Properties, founded in 2003, is a value-oriented owner operator of mid-sized properties, primarily focused on the Boston to Washington, D.C. corridor. Meritage seeks value creation through selective acquisitions, hands-on property repositioning, disciplined operating principals and focused asset management. Since inception, Meritage has acquired interests in nearly 3 million square feet of office space and approximately 500 residential units valued at over $600 million.